Rinker's 330 Express Cruiser was a brand new model for 2008 and is the same boat as the current 340 Express Cruiser. The 330 is sleek, stylish, and feature-packed, with more standard equipment than most other manufacturers offer. Some of the standard features include a generator, heat/air, windlass, electric engine hatch, built-in microwave with integral coffee maker, Corian counters, TV/DVD, cockpit entertainment centre including a built-in blender, fridge/freezer and ice maker. For convenience, Rinker features “It’s Shore Choice” dual side power system with one complete set of shore inlets for each side of the boat, a beautiful swim platform with a built-in “Rumble Seat”, stainless steel drink holders and a huge transom storage locker. The 330 has U-shaped cockpit seating, a double wide helm with flip-up bolster seat and passenger lounger. To round off the exterior features, there are molded steps to the walk-thru windshield. The well designed interior features cherry wood cabinetry and sleeps six in comfort with the generous V-Berth, a mid cabin sofa that coverts to a double, and the unique salon sofa that pulls out to a double berth. 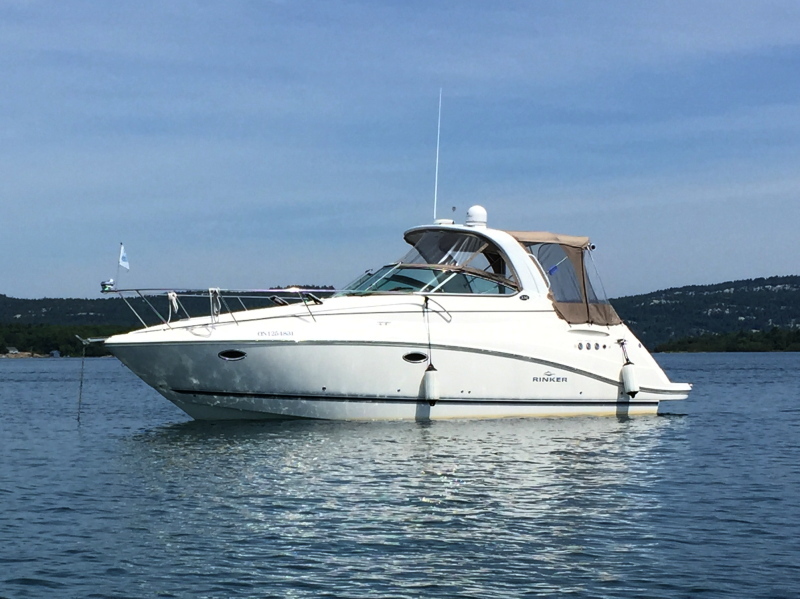 Liquid Asset III is in beautiful condition inside and out, and should be top-of-list for anyone looking for a clean, mid-size express cruiser with up-scale amenities and solid performance. In addition to the endless list of standard equipment, optional features added include a bow thruster, KVH TracVision satellite TV and cherry & holly interior package The house battery bank has also been upgraded for extended capacity away from the dock. She's being offered at a very aggressive price-point as her current owners are anxious to move up. Don't miss out on this super-clean freshwater gem!